Flowers play a major role in setting the tone for weddings. From the bridal bouquet to the decorations at the ceremonial venue, and even all the way to the reception, these flowers can definitely add to the appeal and feel of this very special day and help you wow the guests. 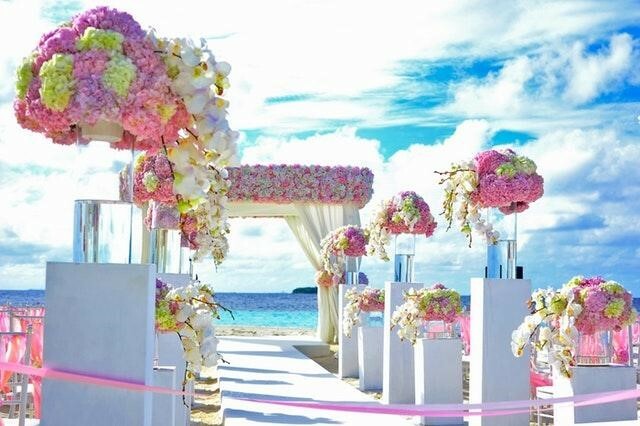 If only for this, you should not think twice about hiring a professional wedding florist to take care of all your floral needs. Beyond that, however, there are various other reasons why you should get this extra helping hand for your big day. And no, it doesn’t have to set you back a good amount of cash too. First of all, it’s not just your bouquet that will have to be prepared for the ceremony—your entourage will have to have their own too, of course. It doesn’t matter if the bridesmaids and maid/matron of honors will be wearing a corsage, a crown of flowers, or carrying a basket of succulents. The important thing is that these are things that would have to be prepared for the event as well. The male entourage may need their own boutonnière to match their female counterparts as well. That’s easily a dozen people with flower needs that will have to be taken care of. At least with a professional helping you out, you can instead focus on your own bridal preparations. More often than not, weddings are done in more than just one venue—the ceremony and the reception. In case the venues are in different locations altogether, it’s advisable that you reiterate the need to transport the flowers from the ceremony to the reception venue. This is a great way to truly make the most out of the flowers you bought, and is a highly cost-efficient practice. This, on top of the fact that it makes for a smooth and consistent theme all throughout the event. You won’t be using all recycled flowers, of course. Table settings, the main table for the bride and groom, and the rest of the venue can also be decked out in romantic floral arrangements. Your wedding florist will be the one directly in charge of taking care of all of that, and basically making sure that everything is in good order before any of the guests or your party arrive. Perhaps the most important thing about hiring a professional to handle your wedding flowers is that you can rest assured that the flowers will be handled with the best care possible. This is the only way to ensure that they will stay looking and smelling fresh throughout the event, which usually starts early on in the day and continues till well into the night. Remember, the flowers do play a huge part in your event’s ambiance. Not only are they going to uplift the look and feel of the event, but they will also make for a lot more enjoyable photo-taking opportunities. Of course, you’d want to keep nothing but good memories from that day, so at least make sure your memory of it will look beautiful as well. Don’t skimp on this investment—and this includes hiring professional wedding florists and choosing the best wedding flowers for this special occasion. Copyrights © 2018 blueforestbaskets.ca. All rights reserved. I consent to Blue Forest Baskets collecting my details through this form.